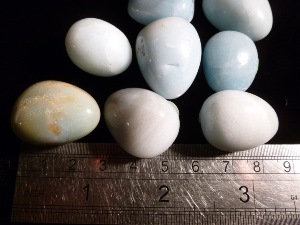 Amazonite is a type of feldspar which crystallises in the form of short prismatic crystals, tabular crystals, or masses. It usually occurs in the turquoise colour and is sometimes found with yellow, white, or grey portions. Amazonite was originally named after the Amazon River in South America where there were significant deposits of this stone. Today Amazonite is sourced from Brazil, Madagascar, China, Russia and Mozambique. Amazonite a lovely crystal to assist us through everyday life, offering a balancing of our emotions. It can help us to seek clarity and self awareness, setting boundaries both within ourselves and externally where necessary. Amazonite can help when suffering an emotional trauma, helping to pacify anger or the temper that everyday life can sometimes make us develop. It helps to make us aware of (and assist in removing) negative and irritating energies around us, helping us to move forward to bring more peace and love into our relationships and our world by helping us to attain and maintain our own personal balance. The colour green is for the physical aspects of the heart, Amazonite heals and opens the heart chakra. 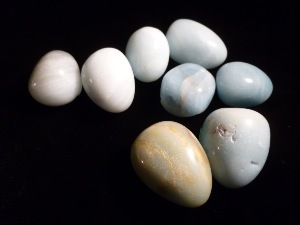 Amazonite can also work well with the throat chakra, especially the more blue/green pieces. 'A' grade tumbled to a smooth finish, an ideal pocket size stone, small enough to carry around with you. Tumble Stones can also be placed around the home for their energies or can just be nice decorative items. crystal gemstones of varying sizes selected specially for your order.